The index opened positive just above 7756 and stayed positive for the entire session of trade to close near the highest point missing 7800 by a whisker at 7791.70, a huge gain of 52.15 points. On a week on week basis the index gained 223.15 points or approx 2.95%. The broader market was also strong, with 927 advances to 619 declines. Range for the time being at 7600-8000. 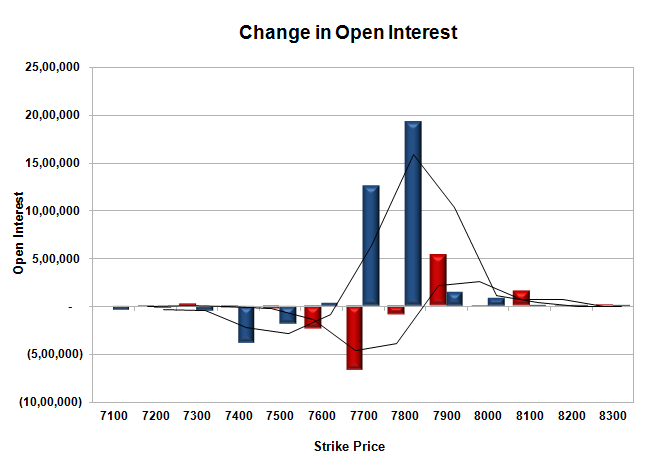 Call option 7900-8100 added huge 6.73 lacs OI with short covering seen at 7700 and lower strike prices. Put option 7900-7700 added huge 33.35 lacs OI with profit booking seen at 7500 and below strike price. 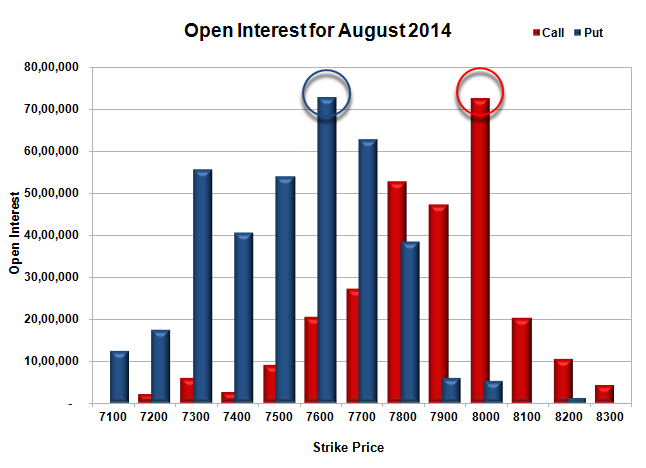 Nifty Open Interest is at 1,43,93,400 up by 2,59,250, with increase in price, most probably long build-up. Bank Nifty Open Interest is at 16,28,100 up by 38,550, with increase in price, most probably long build-up. FII’s bought huge 7.74 lacs Futures, which includes 9643 contracts long build-up and 5835 contracts short covering, with increase in net OI by 15478 contracts (includes 54348 longs to 38870 shorts for the day) and the average price per contract comes to around 7772.96. FII’s Index future open contract as on date is 173504 Longs to 102191 Shorts, net long 71313 contracts. PCR Open Interest (Volume) is at the highs of the series at 1.246. Initial and very good support at 7700, with huge OI of 62.89 lacs, whereas best support at 7600 with highest OI of 72.91 lacs. Initial resistance still at 7800, with huge OI of 52.78 lacs, whereas best resistance still at 8000 with huge OI of 72.72 lacs. 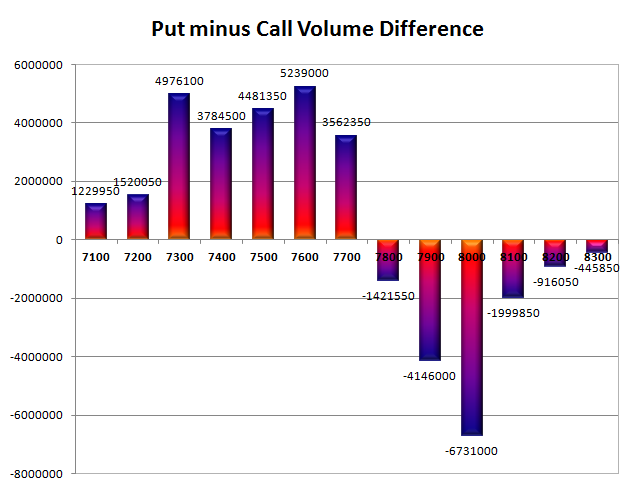 Day Range as per Option Table is 7719 - 7842 and as per VIX is 7738 - 7846 with 7776 as the Pivot.